• The square hollow interlocking block 245, which allows building up to 2–3 floors high. It is laid with mortar and a grout is cast into the holes. • The rectangular hollow interlocking block 295, which is used only for ground floors. It is laid with mortar and a grout is cast into the holes. 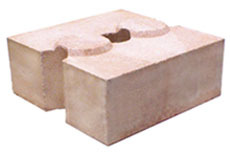 • The rectangular dry hollow interlocking block 300, which is used only for ground floors. It is laid dry stacked and a grout is poured later on into the holes. These constructions implement the usual specifications for disaster resistance (Proper design, horizontal and vertical reinforcement at regular intervals, by linking the foundations to the roof with vertical ties, etc. 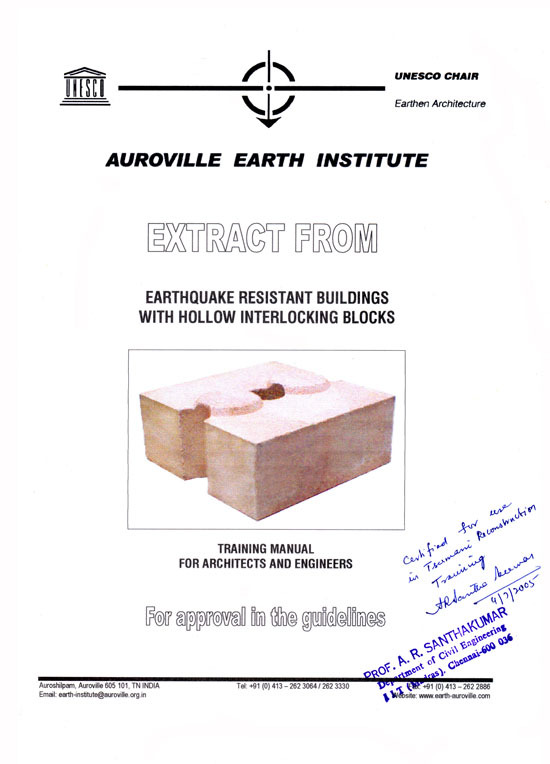 ), which have been certified by the internationally renowned expert Dr. Anand S. Arya, professor Emeritus-Earthquake Engineering Department – Roorkee, and seismic advisor to the Indian government. 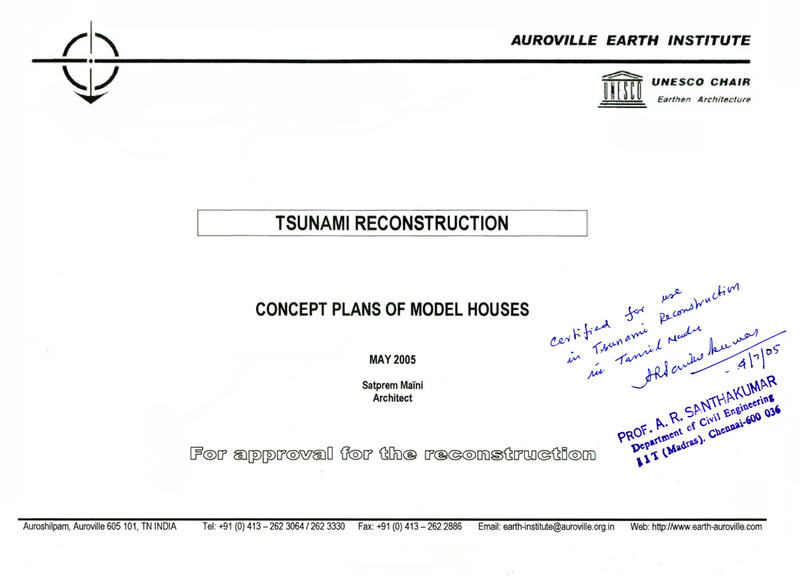 The first prototype of an earthquake resistant house was built at Istanbul, Turkey in 1996. It was sponsored by UNCHS/HABITAT. It was pre-cast in 10 days using semi-skilled labour and it was assembled in 8 days during the “1996 City Summit / HABITAT” at Istanbul – Turkey. It was done at the request of CRATerre. 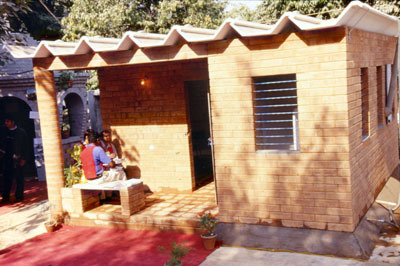 A second prototype of an earthquake resistant house was sponsored by HUDCO (Housing and Urban Development Corporation, Government of India). It was built in 1999 as a demonstration at New Delhi, India. It had been built with all facilities like water and sanitation, kitchenette and a smokeless stove. It was pre-cast in Auroville and transported over 2,900 Km to New Delhi in a single lorry of 22.5 tons. It was assembled in 66 hours by our 18-man team. 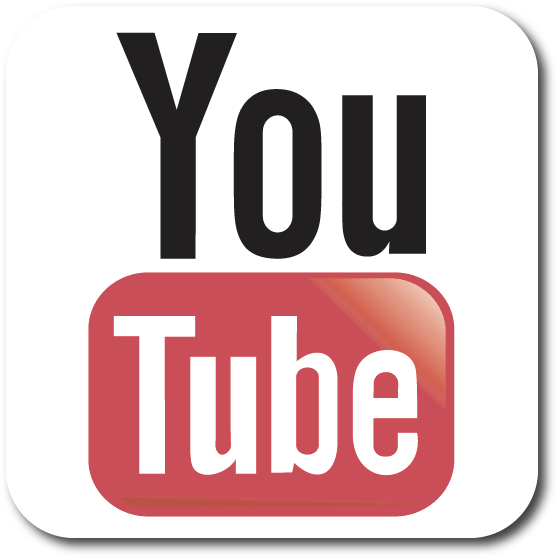 This demonstration was granted a gold medal from ITPO. 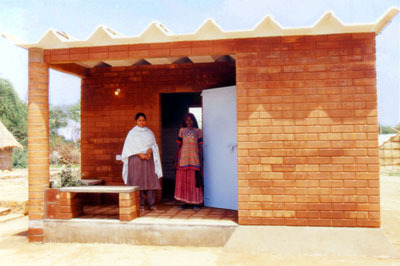 In July 2001 another demonstration house was built in Gujarat to start rehabilitation programmes for the zones affected by the severe earthquake of January 2001. 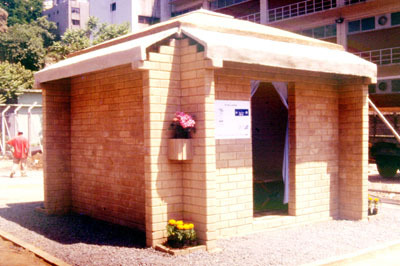 This model house has been simplified and built without sanitation. It had also been improved and reinforced. It was pre-cast in Auroville and transported to Gujarat, where it had been assembled in Khavda village in 62 hours by our 20-man team. The demonstration house which was built at Khavda village set up an example of what could be done with stabilised earth. 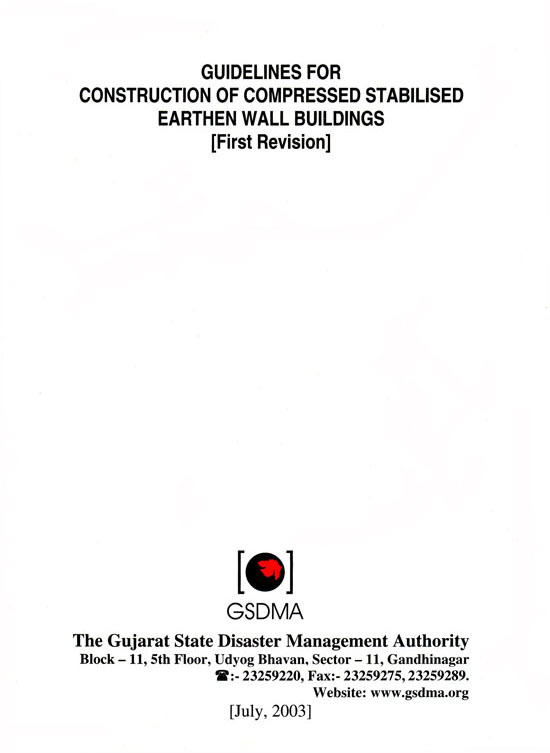 Thus, the government of Gujarat accepted our technology and prepared some guidelines for building with stabilised earth. 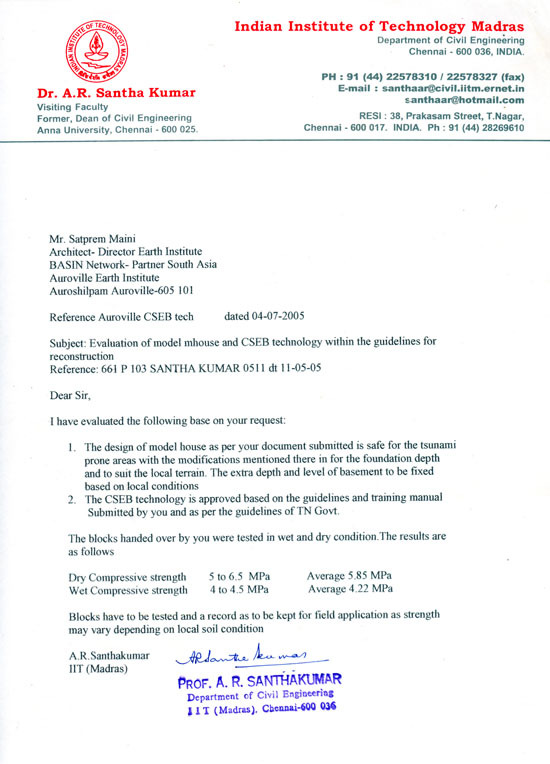 The NGO Catholic Relief Services (CRS) adopted this technique and the Auroville Earth Institute conducted several training courses to transfer this technology to the CRS. The Auroville Earth Institute assisted the CRS in their rehabilitation programme and the Catholic Relief Services built in a year 2,698 houses of many different types in 39 villages. • The government of Gujarat, India, as a suitable construction method, up to two floors high, for the rehabilitation of the zones affected by the severe earthquake of January 2001 in Kutch district. 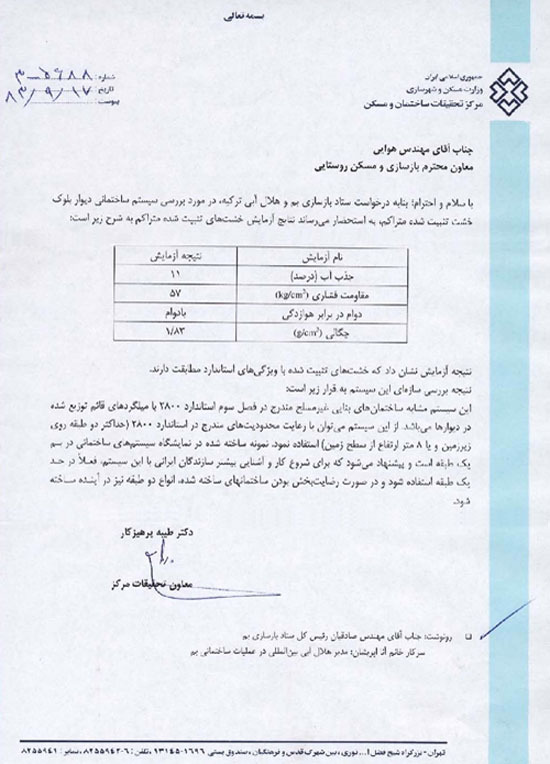 • The Government of Iran (Housing Research Centre) as a suitable construction method, up to 8 m high (two floors), for the rehabilitation of the zones affected by the 2003 earthquake of Bam. 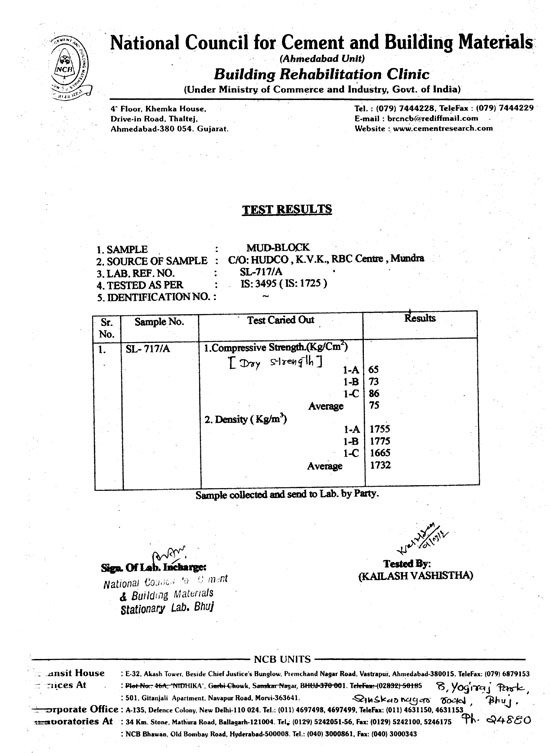 According to the table of results, the blocks are standard. This system is the same as masonry structures of Iranian earthquake standard (2800) with reinforcements. In this case it is possible to construct the 2 stairs buildings with the height of maximum 8 meters from the ground level. The sample house which was built in the Exhibition site in Bam is just one stair building and for reconstruction projects in Bam this system with one stair building is recommended.